Welcome everybody! The Green Lanterns... easily one of the most powerful heroes of the DC Universe, seriously! The rings grant them the freest manipulation of power possibly through their willpower. They kinda channel willpower that can shape through constructs and with that raw force maintain the peace in the universe working for a sort of inter-galactic police force called the Green Lanterns Corps. Ok, ok… there’s that thing with the yellow spectrum of colors…everything that’s yellow is immune to their power, so what? Just add up to the ring and lantern battery recharger kit a two or three buckets of green paint. I’m obviously biting a bit in the yellow-thing business but although this is the first comic I read in the Green Lanterns story I know that yellow is the color of fear and that’s probably the connection they try to make in this Origins since fear is the number one thing that they are always saying in green lantern boot-camp that can mess-up with their willpower and directly with their super awesome capabilities. 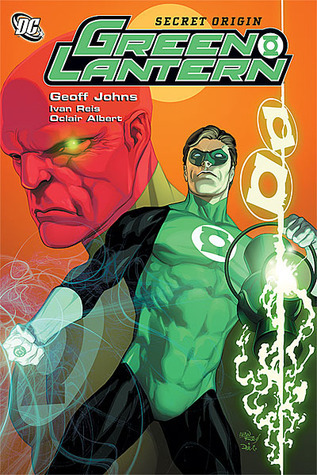 And fear is the first thing we can read Hal Jordan talking about, this story shows us how the greatest human Green Lantern started and that was the main reason I read it first instead of the other first printed stories. I liked this beginning mainly because of one major point, when I was reading it my eyes and curiosity where not only focused in Jordan they were also in Abin-Sur, Sinestro, Carol, Jim, the Asian friend that I forget the name all the time. All their stories are well connected and stand by themselves – they stand together but they also stand alone, and sometimes I think that comics tend to focus too much in the main hero and the rest it’s landscape easily forgettable – all comes together wonderfully and the artwork is very imaginative and strong. Reading this gives me the curiosity to search for the rest of the story but the problem with 70 years of Green Lantern story development is the feeling that I get kind of lost, so better do some research our maybe if someone that reads this can point me out the next issue to read I would appreciate it very much.